The Team Snowden trained Calanda will carry the top weight in Saturday’s Group 3 $175,000 W.J. Healy Stakes (1200m) at Doomben on Saturday. Calanda, above, has been allocated the top weight for the W.J. Healy Stakes at Doomben. Photo by Steve Hart. Calanda is one of twenty-one sprinters nominated for the W.J. Healy Stakes and has been allocated the top weight of 59kg, 3kg more than his neatest rivals Bassett and Upstart Pride. Calanda will strip fitter for one run back from a spell when he ran a brave first up third behind The Monstar and Platinum Angel in the Group 2 $175,000 Moreton Cup (1200m). Stable representative Nikki Hodgson said that Calanda has improved markedly since that run and she expects the Snitzel gelding to be hard to beat. 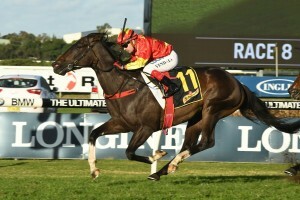 “He has done really well since his run at the Sunshine Coast. He was first up that day and he was always going to improve,” Hodgson told Sky Racing. Calanda’s stablemate I Thought So is also nominated for the W.J. Healy Stakes and will also be fitter after two runs from a spell at Randwick for a first up second in the $100,000 The Main Shake Handicap (1100m) followed by a third in the Listed $150,000 June Stakes (1100m). The Mick Price trained Bassett has just missed out on the minor prizemoney at three runs during the 2018 Queensland Winter Racing Carnival and if he runs this weekend will have to back up after finishing fourth to I’m A Rippa last Saturday in the Listed $175,000 City Of Ipswich Eye Liner Stakes (1350m) at Ipswich.